If you are vegetarian you most likely still enjoy good veggie burgers, so why not try making these chickpea patties yourself? 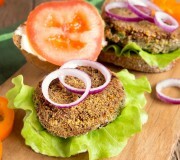 Make your own veggie burgers and you'll know exactly what healthy ingredients are in the veggie patties. You can enjoy the meatless burgers on a bun, or you can throw the veggie patties on a salad with some Greek salad dressing. 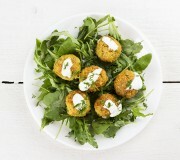 These chickpea patties also make a great snack between meals. They have a slight falafel flavor and texture, so eating them inside a pita is delicious. Rinse dry chickpeas in a strainer and add to a pot. Cover with 2 inches of water and bring to a boil for 1-2 minutes then cover and remove from heat. Allow to set for 1 hour, then drain and rinse again. Dry thoroughly. In a food processor add basil, parsley, garlic, cumin, turmeric, salt, pepper, onion, Eatnuts.com Sun-Dried Tomatoes, tahini, eggs, and chickpeas (slightly cooled). Mix in food processor, adding a little water and tahini as needed to keep a moist texture. Take a taste and add more spices as needed. Remove from food processor, place in a bowl and cover with plastic wrap. Place in refrigerator for 30 minutes to 1 hour and allow flavors to meld and the texture to firm up. Remove from refrigerator. With your hands form 4 to 8 patties. If the patties do not stick together well, add more tahini or an egg. Heat a large metal or cast iron skillet over medium-high heat. Cook the patties on the grill if you prefer. When the pan is hot add oil to create a thin layer on the bottom of the pan. Wait for oil to heat up. Place as many burgers as you can in the pan and allow to cook for 2-3 minutes or until lightly browned. Flip the burgers very gently as they may be fragile and cook for 2-3 minutes. These burgers are fantastic served on a salad with Greek salad dressing or as a burger on a bun with lettuce, tomato, pickles and a sauce of your choice. 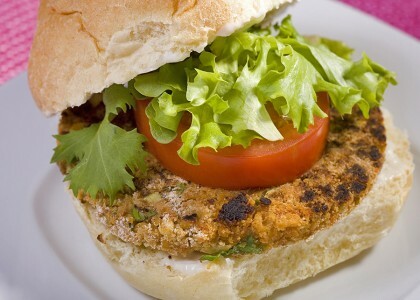 The natural texture of the garbanzo beans combined with the right ingredients in this Chickpea Burger recipe make a delicious blend of flavors. You can taste the hints of parsley, cumin, basil, and sun-dried tomatoes giving each veggie burger a wonderfully unique flavor. The garbanzo beans make it hearty and will leave you feeling full, satisfied and content. This raw burger is any raw vegan's dream come true! 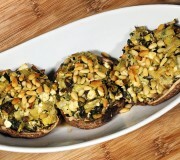 A great lunch idea containing lots of almonds and pecans to fill you up and give you sustained energy.